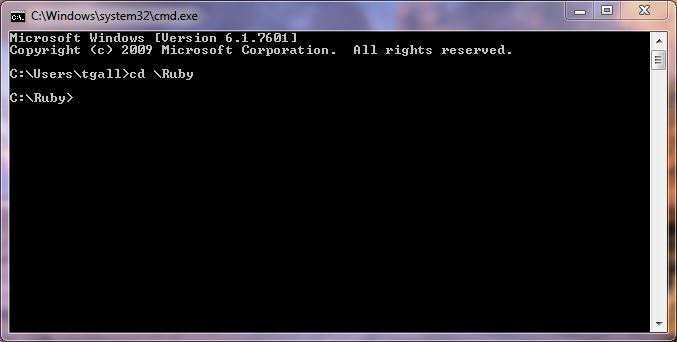 yep, a ruby app is going to run natively off an OS's command line normally (windows would be the command prompt). give me a few minutes and I'll download the ruby interpreter and give some screen shots. this creates a file association so .rb files get opened by the ruby runtime by default. you only need to do this once. print "Hi friend. What's your name? " print "Hello, " + name + "." 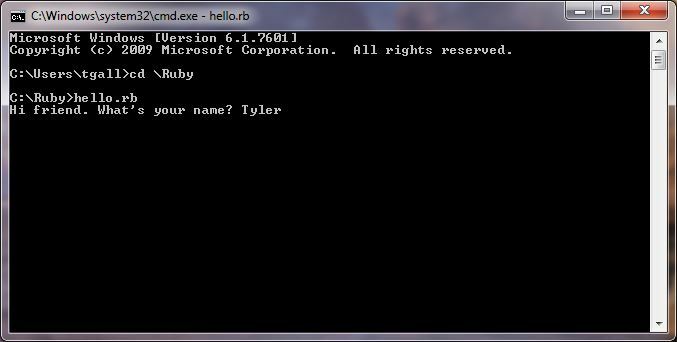 Next, type in the name of the rb file and hit enter and it'll start the application. Voila, ruby in the command line. What did you do before this happened? Can we see what code you have written so far? You should be running command prompt, not start command prompt with ruby. Also, manually type it in or only copy -> right click -> paste one line at a time, hitting enter after each paste. ah OK that was my mistake i just copy and pasted it but im still pretty sure its not supposed to do that. I'm not entirely sure what you did to get the question marks but it didn't any damage or anything; failed to recognize it as a command and went on it's merry way. Sweet sauce i finally got it to work with my minor skills! thanks guys! Here is was I recommend, don't glue yourself to a project until you are done learning. It may seem like a good idea to come up with an idea early so you can try to excute on it while you are learning but that usually ends in disaster. Ideas are cheap and you will have plenty of ideas over the course of learning to program, write them down and when you actually feel like you can get everything to work see which stands out as the most doable. As others have said, don't do games that draw on skills you don't have. So unless you can get a writer on your team having the game be heavy in writing is a really bad idea since it will be really clear to the audience. By the way, who is your audience? Do you plan on releasing this game for money? If so you should keep in mind that most normal gamers don't known how to work in the terminal so that could become a problem down the line. This kind of game would probably be more success will people who use things like DOSbox, but I'm not sure if Python or Ruby is compatiable with DOS. I am trying to find out where I need to look to figure out how to start to a file search based on a payload. In the end, Id like to play the searched media file to MPC. How complicated is this going to be? Edited by Undine, 29 February 2016 - 09:38 AM.